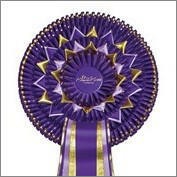 In this section you will find pictures of some of the rosettes and sashes that we have supplied to our customers. All of these rosettes can be made in any colour and with any printing. Click on an image below for a larger version. Use the arrow(s) or numbers below to see the next page.